The Making of The Three Tenors Book | Graphic Design NY | Clare Ultimo Inc.
From "Graphic Design Inspirations and Innovations 2"
Objective: "Warner Music International wanted to give each of the 'Three Tenors,' plus conductor Zubin Mehta, a corporate gift to commemorate their 1994 U.S. tour," explains Ultimo. 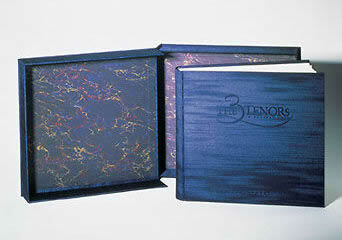 "We had given Warner Music a New Year's gift that was a custom-designed, limited edition handbound book. They asked if we could make one in the form of a photo album for the tenors. The client wanted the album to be slightly larger but similar in fashion to our small, Japanese-sewn book. It seemed possible at the time, although I had no idea of the project's scope when I began." Challenge: Ultimo realized that Japanese binding wouldn't be sturdy enough for the album, and a sturdier binding would have invalidated her design and production quote. While she was trying to figure out how to bind the needed six books, the client decided that he needed twelve. In early November, she learned that the books had to get out by December 21, but no bookmaker could make all twelve books within this time frame. Then the client increased the page count and requested that the book be divided into six sections, each with a calligraphic heading. "Through some miracle, I saw a solution. I called the bookmakers again and suggested that two of them split the quantity. At the time, I felt this was totally weird, since if I was asked to design half a project, I probably would refuse, thinking my work would be compromised. Luckily, I found two celebrated New York bookmakers who knew each other and, as one put it, 'I would only be willing to do this kind of thing with Carolyn. She does great work.'" A calligrapher was hired to letter the section headings, and the specific vellum he wanted to use was found in stock. Or so it was thought, when someone went to pick it up. Wrong. It would take three weeks to get the vellum. A lesser quality vellum was substituted. Meanwhile, the bookmakers had estimated the job and secured the amount of silk cloth needed for the album's covers. The client then requested a slipcase for each book. The bookmakers reestimated the job and informed Ultimo that there was not enough cloth to do the albums' covers and cases. After four tense days, the bookmakers finally located additional cloth. Meanwhile, the client was editing thousands of tour slides down to a few dozen for the book. Because the photos would be hand-glued onto the bound album pages. Ultimo created a template system for the bookmakers to use when positioning photos. The system was also useful for the client when planning the photo layouts and sequences. The client completed the editing and created a dummy book showing their photo choices in position. But, unfortunately, not always in a position that conformed to the templates. "Political" choices, the client explained. The templates were remade for the bookmakers. When the photographic prints of the chosen slides arrived from the vendor, they, too, were flawed. Many standard-size photos varied in dimension by up to a half inch. The templates were again remade for the bookmakers. Finally, only two days prior to the albums' shipping date, the client called with two last requests: "Can you make two more albums?" Uh...no problem, after the books are shipped to the tenors. And, "Can you number the books so the Warner people understand that only a limited number was created?" Uh...OK. But by now the albums were finished. The calligrapher completed the numbering at the Ultimo studio in two days, after having requested complete silence. "Of course, we complied," says Ultimo, "and each book was perfect. Whew!"